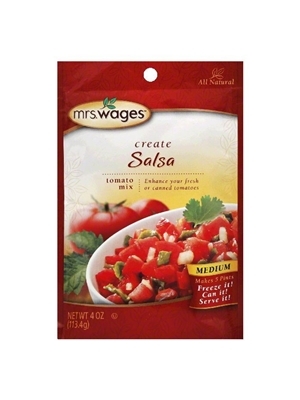 Mrs. Wages Salsa Mix Medium is a top selling brand of the fast growing tomato sauce mix category of the home canning market. Use this mix, containing just the right spices with fresh or canned tomatoes for a zesty salsa you’re sure to make again and again. Makes 5 pints and is ready to eat 24 hours after preparation. 4oz. Remove skins and cores from tomatoes and chop coarsely. Combine mix contents with chopped tomatoes and vinegar in a large pot and bring to a boil. Stir occasionally. Reduce heat and simmer 10 minutes. Stir occasionally. Salsa is ready! DEHYDRATED VEGETABLES (ONION, GREEN BELL PEPPER, JALAPENO, CHILI PEPPERS, GARLIC), SALT, SPICES.